There are many sites to see in the city of Helsinki and we remembered fondly our first visit when we saw the huge cathedral and climbed all the steps to its door; stopped to see the Temppeliaukio, the huge rock church carved out of solid rock, and the pipe sculpture in Sibelius Park, and of course the wonderful Kauppatori Market Square. Once we turned the corner, we recognized the long Esplanade, a huge pedestrian area that runs down the middle of the main street and is a beautiful park where many congregate on benches or stroll along the shaded walkways and watch those who come to entertain—mimes, dancers, singers, jugglers, musicians. At the end of the Esplanade we found the Kauppatori (Market Square) and located the ferry that would take us to the island of Suomenlinna where there is an old fortress. We were dismayed when the ticket machine would not accept our credit card. Many of the areas we visited on this trip would only accept credit cards in machines if they had a micro-chip in them. The ticket seller would only take cash so we set off to find an ATM. 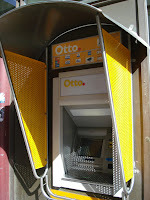 Their ATMs are called OTTO and it took a while to locate one. 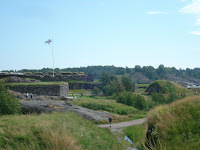 Once we had cash and tickets, we boarded the next ferry (they ran about every 15 minutes) and made the short trip to the Sveaborg (fortress). The weather was again very pleasant and we spent a couple hours strolling around the island and seeing the various parts of the fortre ss. Sand dunes camouflaged bunkers and huge cannon on large platforms that could be turned pointed out to sea. 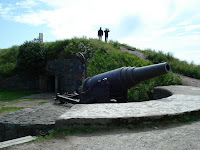 In its day, (the fortress was originally built in 1748) it must have been a formidable defense for the city. 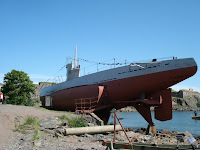 Down one side path, we found a U-boat on display. A tasty lunch of vegetarian pizza with blue cheese and a couple of ciders at the Kings Gate end of the island, and we were fortified to finish seeing the sites and enjoying the view of several wedding parties lining up at the c hurch. 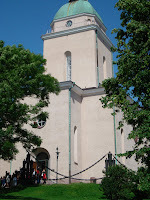 By the way, the church is surrounded by a fence made up of heavy chain links and upside down cannons. A statement, I wondered?